Here is my current progress on Sarah Elizabeth Brooke. I got the second story stitched while I was in Myrtle Beach. The Shaker Lady came to Myrtle Beach again. I couldn't resist last year and I couldn't resist this year either. I ended up getting this beautiful Shaker Basket. I think it will go really well with my tray. Well, I've been pretty busy this week with a class party, a field trip, a parade and field day. I'm so ready for the weekend! I hope to get started on the third story of Sarah E. Brooke. My dad and his wife will be coming on Sunday, so I'll be doing a lot of cleaning too!! How do you find time to stitch?? But stitch you do, and it looks fantastic! Hard to resist those Shaker baskets, isn't it? Love your Shaker basket!!!!! Love the current project!! Have a great weekend! Oh my, who is the shaker lady and how do I find more out about the basket!!! I wouldn't have been able to resist the basket either! Your stitching is coming along nicely too. Your stitching is beautiful, Nicole. Such a pretty house! Love your Shaker basket, too! Sarah Elizabeth is so awesome! Great basket too. Have a great weekend. I really love your Sarah, but i think I'm working on too many samplers with huge houses right now. I need to finish a few of them before building another house. Your Shaker basket is wonderful. I have a few boxes, and mainly use them for display, but my smallest one is what I use as an ort container. Ok, how many times do I have to say it -- I need to get to Sarah! Yours is gorgeous!!!! Wow! Love that Shaker basket too. Yum! You have been so busy how do you find the time to stitch? Your sampler is beautiful! Love your new Shaker basket! I don't know which is prettier... Sarah or your basket! I wouldn't have been able to resist the basket either. And seeing your beautiful stitching makes it hard to resist Sarah Elizabeth Brooke as well. Have a great weekend! Hi Nicole. It is so much fun seeing your Sarah Elizabeth Brooke progress. You have gotten so much done on it and it is so pretty! I don't have near as much yet on the building but I am loving the bricks. I hope to get the first story on top done soon. We have been riding the scooters lots but it has gotten colder so maybe I will get more stitched on mine this weekend. You do inspire me looking at yours and I love your basket too!!! The stitching is beautiful, as always! The basket is stunning. SEB is so beautiful... and so is your new basket! Great collection - glad you didn't resist. Don't worry so much about the cleaning - enjoy the visit! Beautiful stitching Nicole. And that basket...sigh, I can see why you couldn't resist! Great progress on Elizabeth. I couldn't resist the shaker lady either last year or this. Sarah is looking great! You got a lot done on her at the retreat. 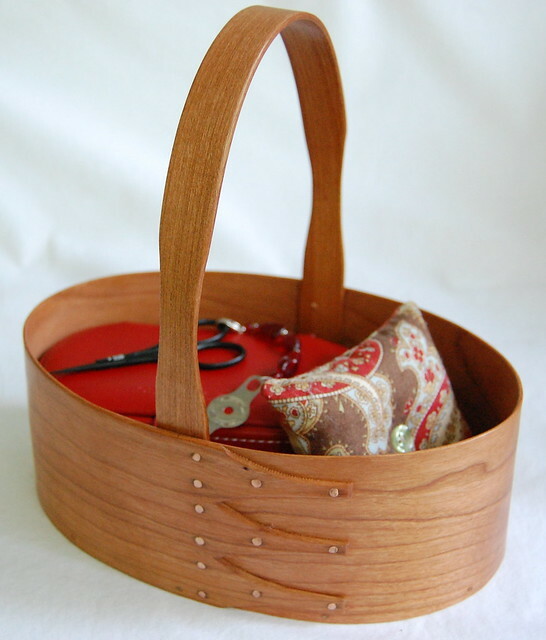 And wow - that shaker basket is lovely, no wonder you couldn't resist! OMG I have to get Sarah Elizabeth. 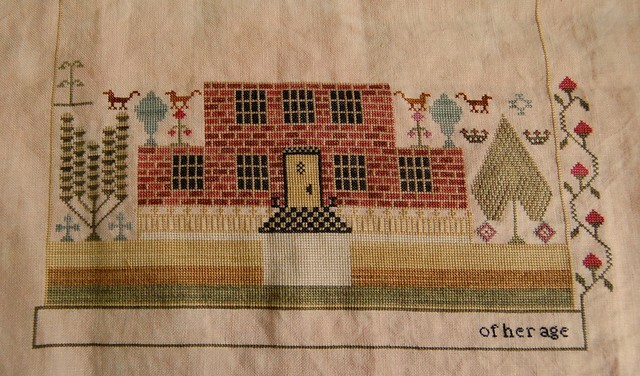 I liked the design but hadn't seen it stitched. Now I love it. Sarah is looking fantastic, she is such a lovely sampler. Love the shaker basket!